Taha (left) and Limoun at the handover. 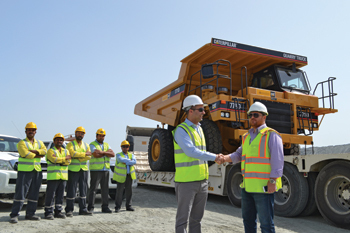 Sharjah-based Mohamed Abdulrahman Al Bahar recently handed over a rebuilt quarry truck to Doha Quarry in Fujairah, through the Cat Certified Rebuild Power Train programme. As part of a contract awarded in 2013 to rebuild seven 771D trucks, Al Bahar has overhauled five trucks, according to Ahmad Taha, senior product support engineer, service and spare parts, Mohamed Abdulrahman Al Bahar. 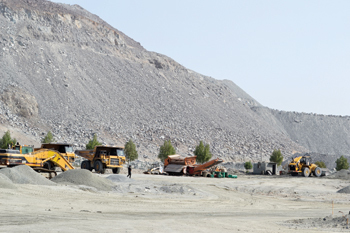 The remaining two trucks will be handed over to Doha Quarry during the course of this year, he said, adding that Doha Quarry is planning to rebuild more machines after the completion of this contract. “As the customers’ operation is critical and cannot be stopped altogether we are rebuilding one machine at a time,” he said. The company offers three types of rebuilds – CPT (Certified Cat Rebuild Power Train); CPT+ (Certified Cat Rebuild programme with hydraulics) and CCR (Complete Machine Rebuild). Commenting on the advantages of the CPT+ programme he said: “It extends the life of the machine for a fraction of the cost of purchasing new equipment. This also means the machine can be restored to its original productivity, saving the customer time on job sites. A rebuild machine offers 95 to 98 per cent availability compared to a new machine. “We not only rebuild machines that are in running condition but also scrap machines. The cost of rebuilding varies from machine to machine depending on its condition,” said Taha. A rebuilt quarry truck at a work site. The same maintenance procedure used for a new machine, is followed for the rebuilt machine. Each machine takes 45 to 50 working days to rebuild. The rebuild is done at the state-of-the-art service centre located in Sharjah, where all the staff is well-trained to do the job on Caterpillar’s instruction, he added. “Before the rebuild, seven trucks were giving the performance of four trucks and there was always a breakdown. We were spending on diesel, tyres and other consumable items. “Each dumptruck before rebuild was able to deliver 2,500 to 2,800 tonnes a day (working a maximum of up to 18 hours) now each machine delivers 4,000 tonnes a day. As a result, we do not have to use all the seven machines, two can be on standby. So we automatically start saving,” he said. Giving an example, Limoun said: “In 2012 we spent Dh600,000 ($163,356) only on tyres for these trucks while last year the figure was Dh400,000 ($108,904). We have been able to save 25 per cent on consumables post rebuild and, at the same time, production has gone up. “We also get good support from Al Bahar. They visit our site regularly to check the machines. In addition, they also train our people. “We are very satisfied with the rebuild programme and will continue to rebuild in order to preserve our assets. If need be, we will buy new machines. Currently we have 32 machines on site, including wheel loaders, excavators and generators,” said Limoun. Doha Quarry started operation in March 2009. The company exports mainly to Qatar, Bahrain and Kuwait. “The aggregate market has started picking up since 2013. With the rebuild, our production capacity has increased. Depending on the demand, we may look at increasing our capacity by setting up another plant/line or another crusher,” Limoun added. Founded in 1937, Sharjah-headquartered Mohamed Abdulrahman Al Bahar is one of the leading business houses in the Gulf. The company represents Caterpillar in Bahrain, Kuwait, Qatar, UAE and in Oman through its associate – Oasis Trading and Equipment Company. Caterpillar machinery and power systems are supplied by Al Bahar for a wide variety of applications including earthmoving, building and heavy construction, mining, road making, demolition, waste and scrap handling, electric power generation and marine propulsion. The company employs more than 2,800 and experienced staff across its 11 branches around the Arabian Gulf. Services offered by the company include customised solutions for equipment and power systems requirement including sales and rental (new and used); the region’s highest full-fill-first-pick availability of spare parts and the best-in-class service support that includes workshops and field service, fabrication, maintenance and repair contracts and training.